Super B contains a natural form of folate from lemon peels called Orgen-FA®. Most folic acid on the market is synthetic and therefore the body cannot break it down into a usable form which is beneficial to the body. Ultimately the body must use folate in the form of 5-MTH folate to support healthy dna repair through the methylation cycle*. Vitamin Bs are water soluble and therefore must be replenished daily, as they are not stored in the body. 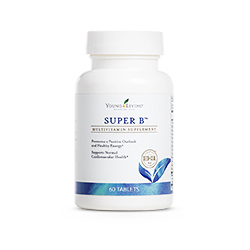 Want to Purchase Super B Vitamin B Supplement? What is in Super B Vitamin B Supplement? What Essential Oils are in Super B Vitamin B Supplement? What are the Documented Uses for Vitamin B Supplements? * Aging, supports healthy brain function and cognitive health; healthy function of nervous system and neurotransmitters*. Supports Genetic SNPs of: MAO, COMT, MTHFR, MRR, PEMT, and ACAT*. How do I use Super B? Take 2 tablets daily with food or as directed. Can this be given to Animals? Yes, however with caution due to nutmeg. If taken on an empty stomach, you may experience a temporary niacin flush/warming sensation. Best taken with food. Want to Purchase Super B Supplement?